My new book, Foolproof: Why Safety Can be Dangerous and How Danger Makes Us Safe is a fresh, entertaining and provocative story about financial crises and other catastrophes. You can pre-order it by clicking on one of the links below. It will be go on sale on Oct. 13. “Our country is always at risk for sloppy thinking about, well, risk. Fortunately, there’s an antidote: Wall Street Journal columnist Greg Ip’s new book, a short, sharp history of the United States’ never-ending search for safety — against every kind of threat, from terrorism to forest fires to financial crises.” – Charles Lane, The Washington Post. “Ip … provides us with not just one of the more informative books on the financial crisis, but one of the more entertaining and readable ones.” – Jared Bernstein, On The Economy. “Ip … travels far and wide to illustrate his premise in this meticulously researched book.” – Caroline Baum, Marketwatch. “If you enjoyed Malcolm Gladwell’s The Tipping Point, Nassim Nicholas Taleb’s TheBlack Swan, or Levitt and Dubner’s Freakonomics, prepare yourself for a major holiday treat… Foolproof is cut from the same bolt of lightning. Foolproof may change the way you think about some of the most important political, economic and social problems besetting us.” – Ralph Benko, Forbes.com. “Ip, an intelligent and independent thinker, identifies a tendency to deceive ourselves into believing that we are safer than we really are.” – Arnold Kling, Library of Economics and Liberty (one of his 5 favorite books of 2015). Read on for a more detailed description of the book. American strategic economic leadership, to an unappreciated extent, rests on the central role the dollar plays in the global financial system, as the latest Capital Account column argues. China’s success at signing up so many countries as founders of the new Asian Infrastructure Investment Bank, despite American concerns, has fueled a popular narrative of waning U.S. economic influence. In the big picture, this is a sideshow. The real contest for global economic sway doesn’t hinge on the infrastructure bank, the International Monetary Fund or even international trade. It focuses instead on the financial world, where China is seeking to turn its currency, the yuan, into a rival to the dollar, by far the world’s most important currency. The U.S. accounts for just 23% of world economic output, but 43% of all cross-border financial transactions are denominated in dollars, as are 63% of known global central-bank reserves. Not every country needs the IMF or trades with the U.S., yet every country needs access to the global financial system, and that system largely transacts in dollars. This has several obvious domestic advantages: for one, the U.S. government and its companies can borrow cheaply in their own currency. It also gives the U.S. extraordinary strategic leverage, which it has used to devastating effect. In 2005, the U.S. accused a small Macau-based bank of aiding North Korea’s money laundering, drug trafficking and nuclear proliferation. Fearful of losing access to the U.S. financial system, other banks stopped doing business with it, cutting off North Korea’s access to the proceeds of its illicit business. In 2012, after the U.S. threatened to blacklist any bank that helped Iran’s central bank sell the country’s oil, Iran’s oil exports promptly plummeted. Federal and state law-enforcement officials have ordered global banks to pay billions of dollars in penalties for facilitating money laundering for terrorists and drug traffickers and helping countries such as Iran and Cuba evade sanctions. Since the alternative is losing license to operate in the U.S., they comply. During the financial crisis it was the Federal Reserve, not the IMF, that acted as the world’s lender of last resort, printing and lending trillions of dollars to cash-strapped foreign banks. A reserve currency doesn’t get that status by decree; it must be earned. Over time private and public investors have developed the confidence and habit of storing their wealth in American bank deposits or Treasury bonds, invoicing imports and exports in dollars, issuing and trading stocks and bonds in New York, and settling disputes in American courts. It wasn’t always so. While the U.S. economy surpassed Britain’s in size by the late 1800s, international use of the dollar lagged far behind use of the pound sterling because U.S. financial markets were so underdeveloped. American banks typically couldn’t do business across state lines much less international borders, and New York lacked London’s deep, liquid market for trade acceptances—IOUs to finance merchandise trade. With the creation of the Fed in 1913, though, banks would open foreign branches, and the Fed fostered a market for trade acceptances in New York. By the late 1920s the dollar had surpassed sterling as a reserve currency, notes economic historian Barry Eichengreen. Thus, a country needs at least two things to issue the dominant reserve currency: a big economy and a deep, sophisticated and open financial market. China has the first, but not the second. It’s trying to change that. The yuan can now be traded in 14 places outside China. It is used to pay for nearly 25% of China’s merchandise trade. And foreign investors can own up to $1 billion of Chinese stocks and bonds. China is now lobbying for the inclusion of the yuan in the basket of currencies that comprise the IMF’s own currency, the “special drawing right,” or SDR. The yuan remains a long way from being a genuine reserve currency. Since the SDR is only used within the IMF, the yuan’s inclusion is largely symbolic. As Eswar Prasad of Cornell University notes, China has made more progress opening up to foreign investors than providing those investors with something to own. Central banks that want to hold dollars can choose from trillions of dollars of easily traded, safe Treasury bonds. Nothing comparable exists in euros or yen, much less yuan, and it’s not clear China wants that to change. The more yuan foreigners hold, the less control China has over its exchange rate and its financial system. Much of the rise in yuan holdings outside China in recent years was a bet on the currency strengthening, bets that will be called off if China weakens the currency to bolster flagging exports. Still, the U.S. would be wise not to take the challenge lightly. If the U.S. overuses its sway over the financial system in pursuit of narrow foreign-policy goals, it could encourage private investors and countries to seek alternatives—eroding its leverage. 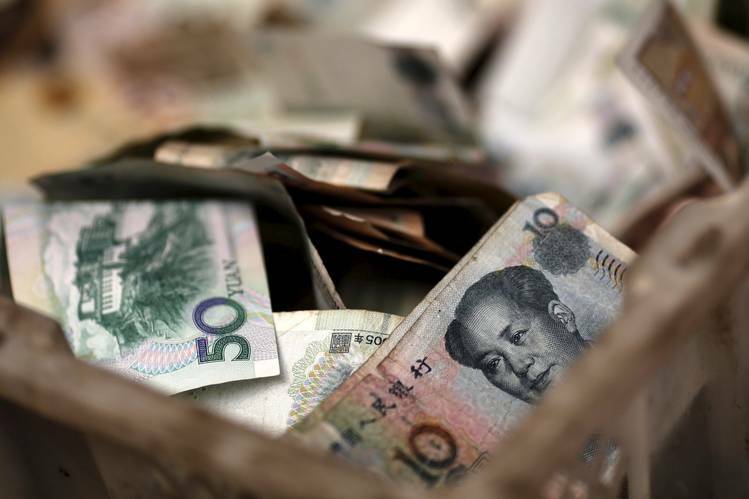 “Once the yuan becomes an alternative to the dollar, rules of the game begin to change,” says Juan Zarate, who helped implement financial sanctions while serving in George W. Bush’s Treasury department. The yuan is still many years away from being that alternative. But if China takes the right steps, the change in fortunes could be swift. Just ask the British. The U.S. accounts for 23% of world economic output. An earlier version of this column incorrectly cited the total as 18%. Oct 25th 2014 | WASHINGTON, DC | From the print edition: IT IS a pernicious threat, all the more so because, at its onset, it seems almost benign. After two generations of fighting against inflation, why be worried if the victory looks just a bit too complete, if the ancient enemy is so cowed as to no longer strain against the chains in which it is bound? But the stable low inflation fought for in the 1980s and 1990s and inflation hazardously close to zero are not so far apart. And as inflation drops, slipping into deflation becomes ever easier. It is in that dangerous position that the world now stands. 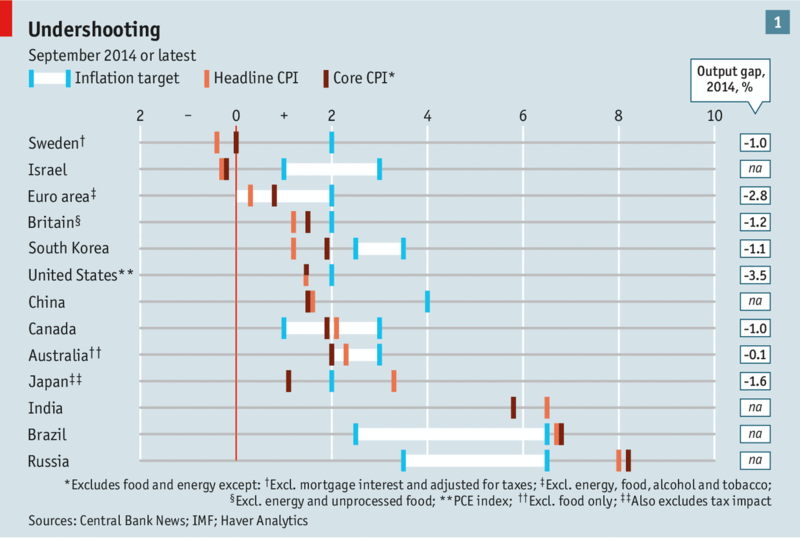 In America, Britain and the euro zone central banks have a 2% target for inflation. In all three, it is below that target. In Italy, Spain and Greece, which have experienced wrenching crises and recessions, it is below zero (as it also is in Sweden and Israel). Japan, which finally escaped from deflation in 2013 after more than a decade of struggle, is battling not to return. Leave out the effects of a consumption-tax increase and inflation there is barely half way to its 2% target. Even in China inflation is below 2%, compared with a 4% central government target (see chart 1). The lowflation of being consistently below an already low target is bad in itself; the deflation it could easy lead to is even worse. There are several reasons. The belief that money made tomorrow will be worth less than money today stymies investment; the belief that goods bought tomorrow will be cheaper than goods bought today chokes consumption. Central bankers can no longer set real (that is, inflation-adjusted) interest rates low enough to restore demand. OF THE many reasons Congress is scorned, fiscal policy tops the list. Since Republicans took control of the House of Representatives in 2010 bitter battles with Senate Democrats and Barack Obama produced a near-default on the national debt, a white-knuckle fiscal cliff and a 16-day government shutdown. Now that Republicans also control the Senate, they have a chance to improve on that record. Their first test comes quickly. Most of the federal government is operating on a temporary “continuing resolution” until December 11th. Without an extension, the government will shut down again. Given the beating their image took last time, Republican leaders are unlikely to want a repeat. They are more likely to seek a deal with Democrats, who control the Senate until the end of the year, to extend it at least until April, when Congress is supposed to pass a budget resolution.